Stitches used: Chain (Ch), Half Trebles (HTr), Double Crochet (DC), Treble Crochet (Tr), Back Post Trebles (BPTr) and Front Post Trebles (FPTr) I have added photos for these post stitches in case you are not sure how to do them. 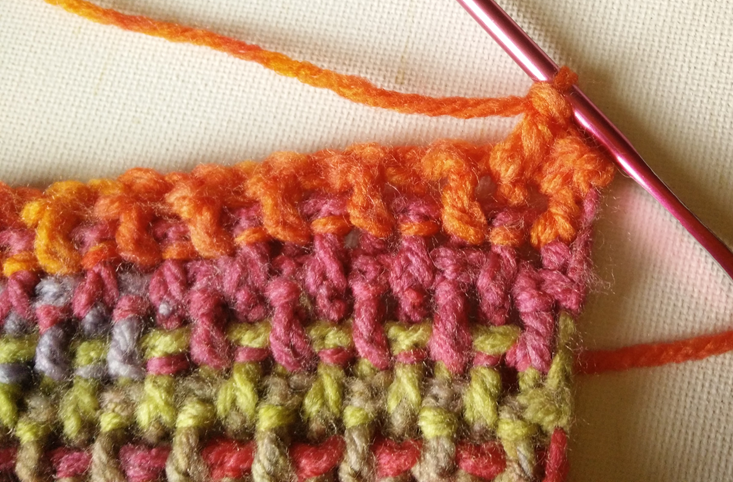 I have made this bag in what I call ‘Fine Basket Weave Stitch’; this is worked by alternating each stitch between Back Post Trebles and Front Post Trebles. 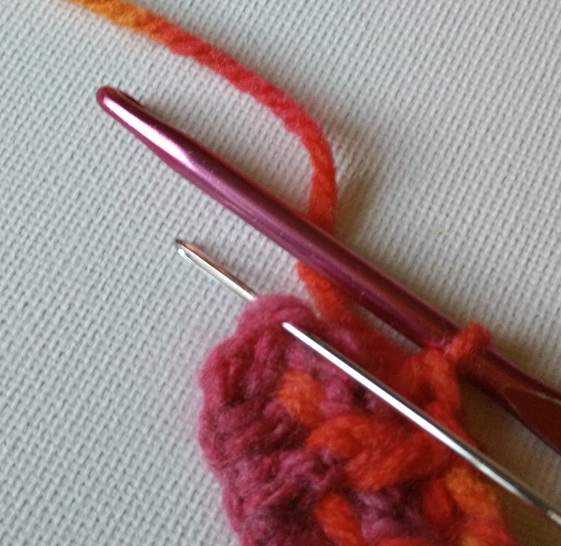 Each part of the bag is made in exactly the same way just with a different number of rows or starting stitches. The bag is made in two panels, a pack panel which is bigger as incorporates the flap that goes over top of the bag and the front panel which is shorter. The long strap goes all the way around the bag, being the bottom, sides and strap part of the bag, but we will get on to construction when all three parts of the bag are made, by that time it should be quite obvious how it is put together. 1 Tr in each Ch along (you should have 49 Tr and 1 Ch3 at the beginning of the row which also counts as a stitch). 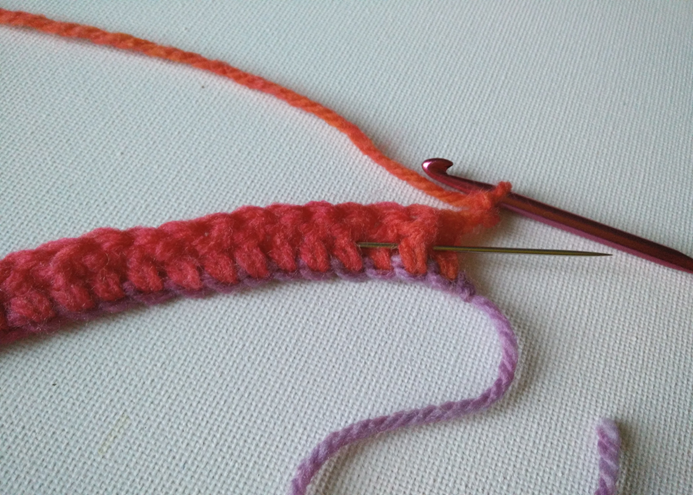 So, Yarn over, put hook around the post of the stitch, Yarn over your hook and pull it back through, yarn over and through 2 loops, yarn over and through 2 loops. 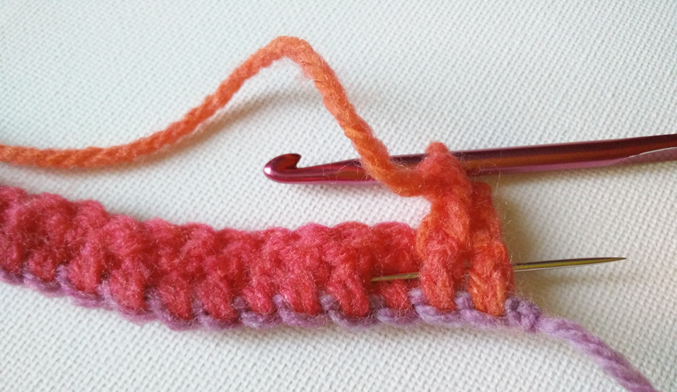 Repeat this along the row, alternating between FPTr and BPTr, the second to last stitch of the row should be a BPtr. 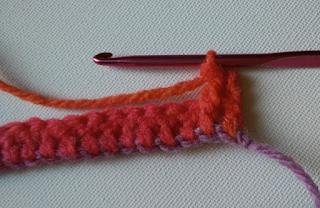 HTr is made by: Yarn over your hook, put it into the stitch where my needle is showing in the picture below. Yarn over your hook and back through the stitch, yarn over and through all 3 loops on your hook. Row 3— This row is the same as the last row only you start with a BPTr, alternate this and FPTr along the row until the last stitch, which is a HTr made into the Ch3 from the previous row (as in the picture above). This is the basic pattern for both of the panels and the strap. Repeat this until the back panel is 32 rows long. The Front panel is made in the same way but only 18 rows long. For the long strap piece the starting chain is only 12 stitches but made in exactly the same way as the panels: Crochet 1 Tr in the 3rd chain from your hook and 1 in each stitch across (10 stitches). Then repeat rows 2-3 of the main pattern. 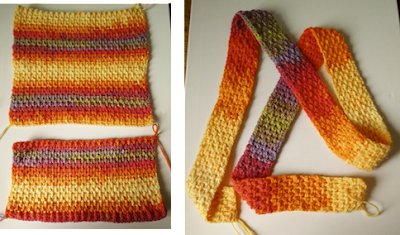 Make the strap 170 rows long. If you get lost about what your starting stitch for the row is, just look at the stitch below it: If it looks like it sits behind the horizontal stripe of the row then the next stitch you make will be a FPTr, or if it sits in front of it, your next stitch will be a BPTr. For example, in the picture below, the next stitch will be a BPTr. You will soon get to recognise which stitch is next as the pattern is worked. 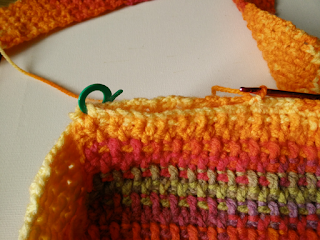 The panels are attached to the strap piece by crocheting them with DCs neatly around. Draw up a loop of yarn, Ch 1 to hold it in place, make 1 DC in the same space. 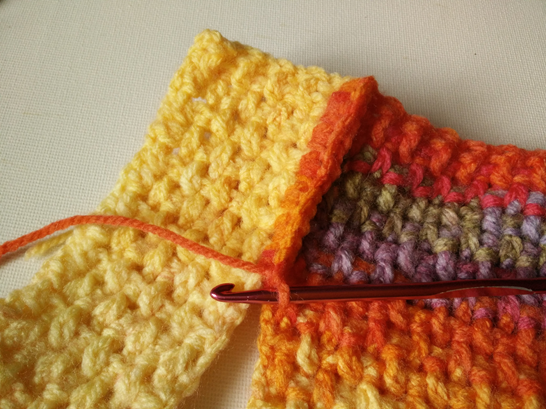 Work along the edge of the bag and the strap by neatly and evenly crocheting around the first/last stitches of the rows. 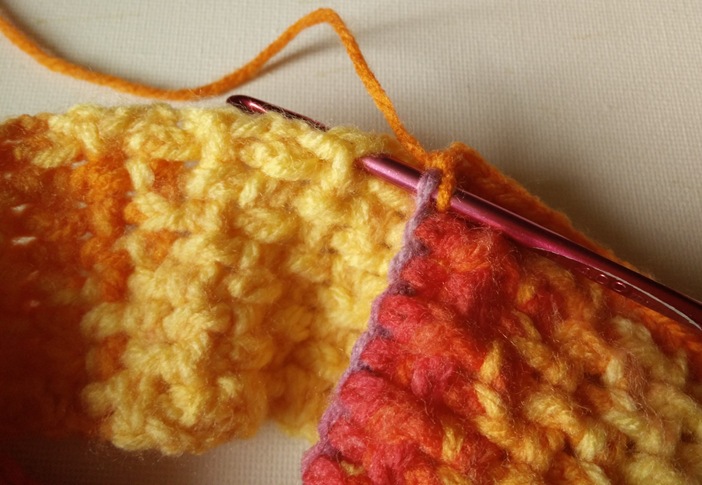 I found that 2 DCs around each row gave a nice neat finish but you may need to adjust this depending on your tension, if you find it is bunching up a bit, add more stitches, if it is a bit stretched do fewer. When you come to the corners, you may need to add an extra stitch. Work along the bottom of the front panel making DCs in the spare chain loops and then back up the other side of the bag. When attaching the back panel it is important to start in the same way that you did the front panel, otherwise the DCs around the edge will be facing the wrong way. So count up 18 rows on the left side of the panel and start at the correct point of the strap, so that your starting point lines up with the top of the front panel, as in the picture to the below. DC around, the same way as with the front panel. 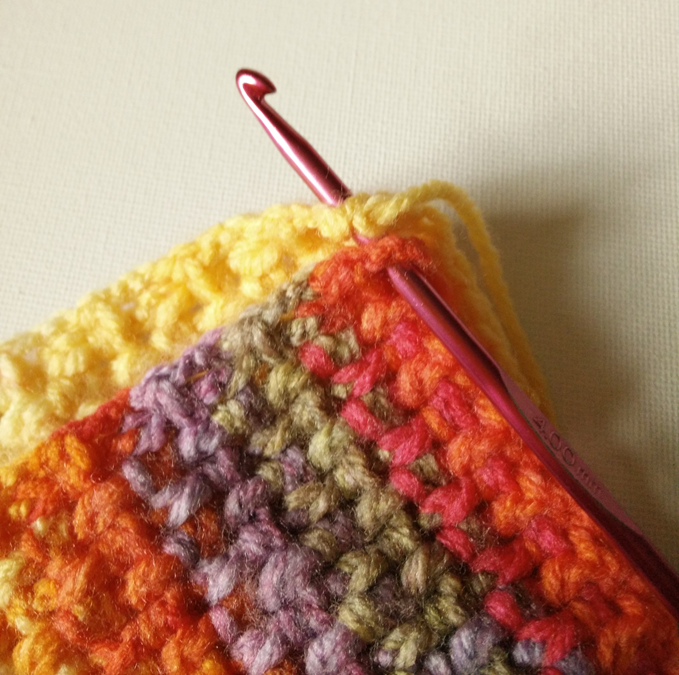 It may help to count along to where the corner row is and put a stitch marker in so you know where to aim for with your DCs, this also helps to hold both the panel and the strap together as you crochet so that both panels line up properly and you get a nice square finish. The button loop is made by simply making a chain of 20 and sewing it on the middle of the flap and finding a button that works well. Adjust the size of the loop to suit the button you use. Add a button to the middle of the front panel. 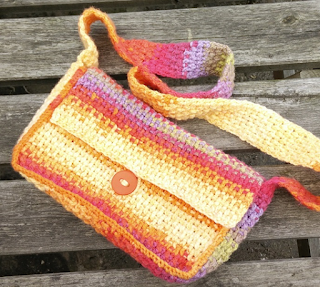 Finish by sewing the bag strap neatly together and by sewing any ends in neatly. Love this! 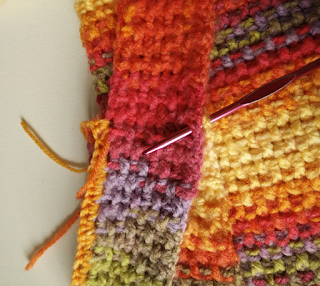 The stitch looks so neat and the yarn you used is beautiful. This is on my to do list for sure. Thanks for such easy to follow patterns.